This year provided plenty of cosmic eye-openers for astronomers and casual stargazers alike. Neighborhood planets such as Mercury and Jupiter received makeovers in both a scientific and literal sense. The discovery of water on the moon and Mars provided clues to the past, not to mention hints for the future of space exploration. A class of newly-detected "Super-Earth" planets around alien stars may ultimately prove more habitable than Earth. And a growing fleet of existing, new and revived space telescopes promises another stellar year ahead. Earth had a front row seat to a multitude of space objects in 2009, with stunning meteor showers, wayward space rocks buzzing the planet and weird lights in the sky – both natural and man-made. Annual light shows such as the Leonid meteor shower continued to dazzle, but some space rocks came a bit too close for comfort. An asteroid exploded over Indonesia with the force of several Hiroshima bombs on Oct. 8, 2009, and became the biggest space rock to take aim at Earth in more than a decade. Weird and wonderful man-made lights also joined the natural light displays this year. NASA launched an experimental rocket that briefly recreated eerie night-shining clouds in September. But the strangest display of all came from a spiraling shape that appeared above Norway in December and sparked massive speculation about extraterrestrials or rogue meteors – before Russia's defense ministry confirmed that a failed launch had sent a missile spiraling out of control. Planet Mercury received a major scientific makeover in 2009, when NASA's MESSENGER probe completed a third and final flyby in September 2009 that should help guide the spacecraft into a Mercury orbit in 2011. A third encounter with Mercury not only helped map up to 98 percent of the planet's surface, but also showed that the surface contains high amounts of heavy metals such as iron and titanium. The surprise has forced scientists to rethink how the small planet evolved. The latest close-up also revealed changing seasons on the planet closest to the sun. Such seasonal shifts take the form of varying chemical compositions in Mercury's thin atmosphere. There's big, and then there's galactic big. A supermassive black hole became the reigning heavyweight champ this year with 6.4 billion times the mass of the sun, after astrophysicists revised earlier estimates of the monster's size by two or three times through computer modeling and telescope observations. The behemoth sits at the heart of the giant galaxy M87, not unlike the massive black hole at the center of our own Milky Way galaxy. Other black holes in nearby large galaxies may now also get a second look, so don't rule out a new black hole challenger in the coming years. A new generation of space telescopes launched in 2009, aimed at seeking out new worlds or unraveling long-standing mysteries of the cosmos. Perhaps none garnered more attention than NASA's planet-hunting Kepler spacecraft, which can detect distant worlds based on the tell-tale dip in light created by a planet as it crosses in front of Earth's view of the parent star. Other notable newcomers include Europe's Herschel and Planck space observatories, which took their first glimpses into the universe this year. Herschel represents the most powerful infrared space telescope ever launched into space, while Planck seeks to survey the "first light" from the universe that emerged shortly after the Big Bang. Last but not least, NASA's WISE spacecraft launched in December with the goal of scanning the infrared sky 1-1/2 times during its mission lifetime. These next-gen telescopes join an older crowd that includes NASA's Chandra and Europe's XMM Newton X-ray observatories, which both celebrated their 10th anniversaries this year. Making the case for a once-wet Mars has never looked better than in 2009. Space rocks lent a helping hand to science by gouging out craters in the Martian surface that revealed almost 99 percent pure water ice near the surface – possible remnants of buried ice sheets that may cover almost half the planet. An extensive map of the valleys crisscrossing the red planet points to a possible ocean in the planet's past, scientists say. NASA's intrepid Opportunity rover has also continued to provide a close-up view of evidence that water may have helped shape the Martian surface. One of the biggest lingering questions going forward into 2010 is whether liquid water can still exist on the Martian surface. A string of globules attached to the legs of NASA's Phoenix Mars Lander represents possible but controversial evidence for liquid Martian water, according to NASA scientists who reviewed the mission's five-month stint from last year. Two of the biggest exoplanet discoveries to date occurred in 2009, as planet hunters took first steps toward finding Earth-like planets outside our solar system. Both cases involved spotting distant worlds passing in front of their parent stars, rather than merely inferring the existence of planets based on the gravitational wobble that they cause in parent stars. First, astronomers confirmed the first rocky world spotted in orbit around another star. 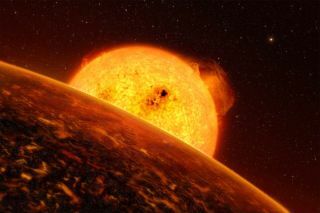 Called CoRoT-7b, the planet represents the first known exoplanet with a density similar to that of Earth – even if the planetary surface seems less Earth-like with scorching temperatures soaring above 2,000 degrees Fahrenheit (1,000 degrees Celsius). A second rocky, water-rich world, named GJ 1214b, also became the first "Super-Earth" to have a confirmed atmosphere. The growing handful of Super-Earths, or planets with masses between that of Earth and Neptune, now stand out among the hundreds of Jupiter-like gas giants detected in orbit around other stars. Some scientists believe that such Super-Earths could ultimately prove better than Earth at fostering the existence of life. NASA's beloved Hubble Space Telescope survived deep-space surgery and emerged in better shape than ever in 2009. The 19-year-old telescope then celebrated its rebirth by spotting what might be the oldest, most distant galaxies ever discovered. Hubble's new Wide Field Camera 3 peered into the infrared wavelengths – about twice as long and "redder" than visible light – to spot galaxies that formed 600 million years after the theoretical Big Bang, or roughly 13.1 billion years ago. If confirmed, the find may replace the current titleholders for earliest known galaxies and most distant object in the universe. Records aside, Hubble also found time to scope out an unexpected impact on Jupiter. What an amateur astronomer first reported as a new dark spot on Jupiter turned out to be a huge planetary bruise the size of the Pacific Ocean, left by a wayward asteroid or comet in the summer of 2009. The massive cosmic impact easily rivaled another from 15 years ago, when Comet Shoemaker-Levy 9 walloped the king of the planets. Astronomers estimated the culprit behind the impact as being no bigger than half a kilometer (0.3 miles) in size. Yet such a cosmic object would have contained thousands of times the energy of the Tunguska impact on Earth, which exploded over Siberia in 1908 and flattened an area as big as a city. An impact of similar size on Earth would have likely proved catastrophic. But Earth observers can count their lucky stars this year and every year for Jupiter, which attracts dangerous space rocks with its massive size and gravitational pull. Perhaps no other space science revelation this year proved as significant as the discovery of water on the moon. A moon long described as a barren, dry environment now dangles the tantalizing possibility of lunar colonies, not to mention a launching point for more distant space exploration. Scientists first confirmed the traces of water in the uppermost layers of the lunar surface, based on detections of either water or a hydroxyl group (oxygen and hydrogen chemically bonded) made by India's Chandrayaan-1, NASA's Cassini spacecraft and NASA's Deep Impact probe. But their findings, detailed in a paper that came out in the Sept. 25 issue of the journal Science, had only just scratched the surface. Then NASA's LCROSS probe slammed into the lunar south pole in October, and everything changed once more. The plume of debris thrown up by the probe's impact revealed water ice, and lots of it. Such ice could either become drinking water for future astronauts and colonists, or could provide hydrogen for rocket fuel. Knowing that water awaits humans on the moon provides a validation of sorts for NASA's goal of putting boots back on the lunar surface. And it may also provide a much-needed boost for new generations of scientists and space explorers to continue pushing into the unknown for 2010 and beyond.